How beautiful and refreshing Winter pastels can be this time of year. 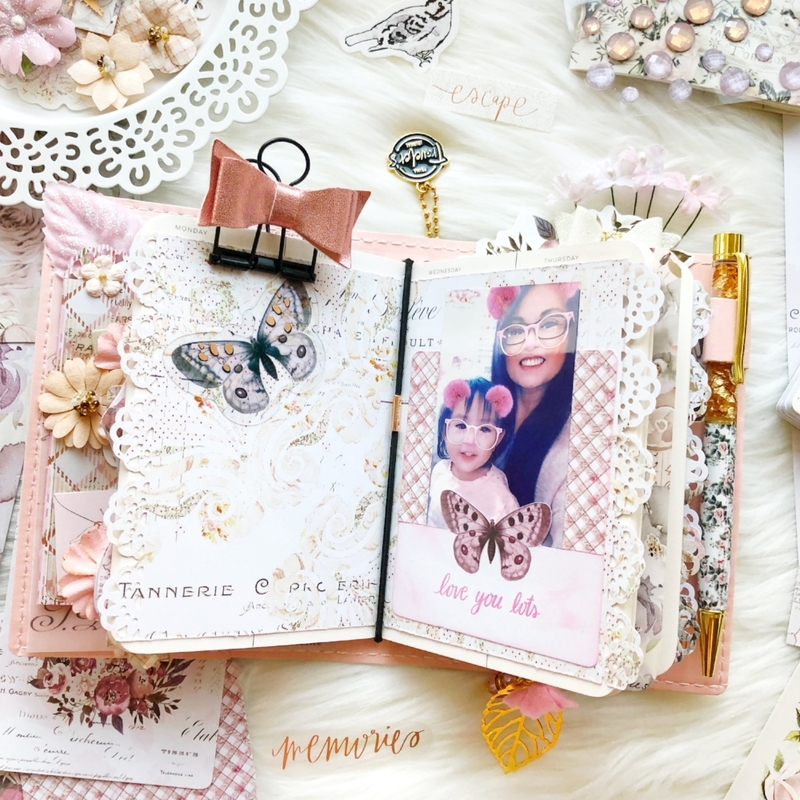 Today Jomelle is sharing her set up using her travel notebook using the new Lavender Frost Collection by Prima, and also sharing her weekly spread. Being a planner/TN enthusiast Jomelle finds herself stocking up on supplies such as pens, patterned paper, stickers, washi and all kinds of stationery. This paper collection made it super easy for her to set up her TN and change her cover of her notebook. Using coordinating papers and stickers with ephemera it was simple for her to customize making all her notebooks work beautifully together. These notebooks are held in place by the bands within her travel Notebook cover. The Lavender Frost collection Lavender Frost - are beautiful papers, flowers, and embellishments with a frosty touch. Cooler tones, warmed up with pretty designs, shimmering foiled accents, and hand-made touches lend a boutique feel to this whole collection! And is shipping now. Many people who use their traveler’s notebooks, use it as their main planner. You can choose a notebook for each category or you can use one notebook for everything. Here Jomelle is using her notebook as a dairy to customize and capture those special moments. Here you will find this beautiful entry in her TN. 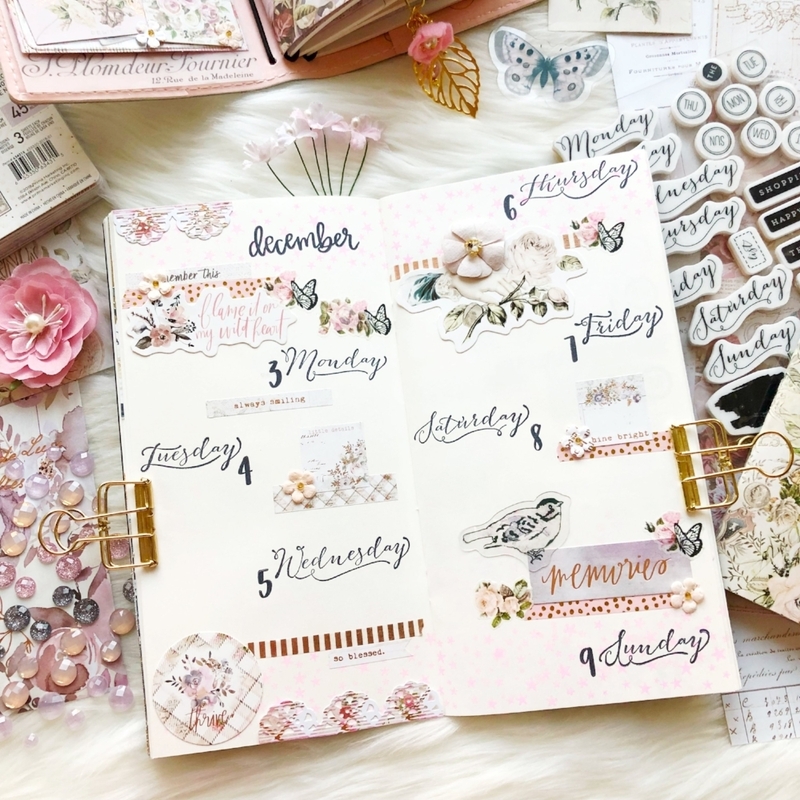 Using the planner stamps and a little imagination, Jomelle created this lovely weekly spread for her calendar notebook. Thank you for stopping by today for your daily inspiration.